By Karin Oenema, March 28, 2010 at 8:09 pm . 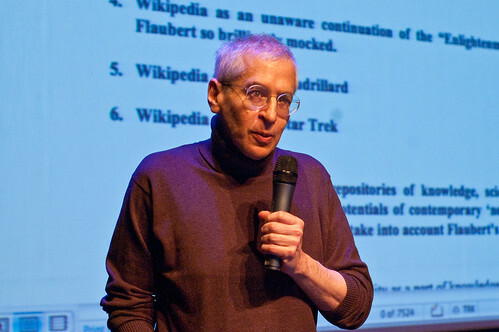 Unlike the other speakers, such as Reichert (Foucault-inspired), Shapiro said that he is less critical: “The critique is all right, however, it should be a component of a larger view, and the larger view should be pragmatic and constructive”. According to Shapiro, Hofmann’s ideology critique is insufficient. Blindness and ignorance are a weak thesis within ideology critique. Shapiro is inspired by the work of Gustave Flaubert: “He shows that knowledge is based in society and as such Wikipedia not only represents knowledge, but also stupidity. And what most people believe in society is based on accepted clichés”. We must separate the real knowledge from the clichés and the stupidities. scholar who has dedicated a lot of research on particular issues. A model for balancing these two contributory streams needs to be developed. So, is Wikipedia cool? Shapiro thinks that baseball fans think that Wikipedia is cool. A lot of these articles on baseball are really good because they are based on information in a non-controversial area instead of a mixture of clichés and real knowledge in controversial areas, as in many articles. During his talk, Alan showed some examples in the Baudrillard article at Wikipedia. In this example one of the clichés is that Baudrillard would Be a philosopher; but Baudrillard never considered himself to be a philosopher so you can’t describe him that way according to Shapiro. Another example is that Baudrillard also has been described as a sociologist, but he disliked sociology, was skeptical towards the concepts of politics, and did not consider himself to be a sociologist. The Wikipedia article mentions Baudrillard’s collaboration with CTHEORY (which really happened, and they published translations of many of his essays), but fails to mention his crucial and essential collaborations with the French journals Utopie and Traverses. During his long enumeration, Shapiro received a question from the audience if ever pushed the submit button. He did , and he is now going to undertake the project of trying to submit step-by-step revisions of the Wikipedia articles on Baudrillard, Star Trek, and Flaubert’s novel Bouvard and Pecuchet. 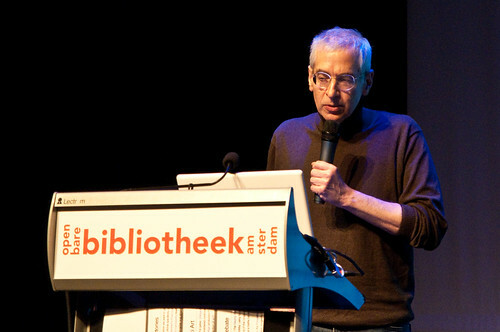 Alan Shapiro would also want to address the question of how the structure of the database as technological artifact will be upgraded by the New Computer Science; but unfortunately he was running out of time. What he did say was that Wikipedia is a conventional database whereas what we need is a new logic engine, which applies Derrida’s deconstruction in computer science, we need to deal with post-structures instead of structures in the database of Wikipedia.